If you’ve ever read the small wording on the back of the toothpaste tube, you’ll see the following warning: “Keep out of the reach of children under 6 years of age. If more than used for brushing is accidentally swallowed, get medical help or contact a Poison Control right away.” As a parent, I have to admit that this warning sounds terrifying. What in the world do they put in toothpaste to make it so dangerous to swallow? How much is “more than used for brushing”? How concerned should I be about my child swallowing toothpaste? In this blog post, I’d like to give you a little information about the ingredients of toothpaste and what you need to know about this warning label. Carbomer 958: a thickening and stabilizing agent. Carrageenan: thickening and stabilizing agent. You’ll find this in lots of food products. Carboxymethylcellulose sodium: “Cellulose gum” is a thickener in the creamier toothpastes. Cocamidopropyl betane: This comes from coconut oil. It makes toothpaste foam up nicely and helps the paste maintain its flavor while in the tube. D&C Yellow #10, D&C Red #30: Synthetic dyes used in cosmetics and pharmaceuticals. FD&C Blue #1: Sythetic dye used in cosmetics and pharmaceuticals. Glycerin: Balances and maintains moisture levels to keep the paste from drying out. It also contributes to the clean feeling you get after brushing. Hydrated silica: This is basically a fine sand in gel form that provides the abrasive scrubbing function of toothpaste. Mica: this is a mineral that makes toothpaste sparkle. It also provides some abrasive action. PEG-8, PEG-12: Polyethylene Glycols are used in toothpastes as humectants (prevent water loss) and solvents. Propylene glycol: An organic alcohol that acts as a humectant in toothpaste. This probably causes contact dermatitis and even hives in some people, even at very low concentrations. PVM/MA copolymer: This binds ingredients together. Sodium benzoate: this keeps microorganisms from growing in toothpaste. Cold would be effective as well, but too many people have sensitive teeth already, so this is the solution. Sodium fluoride: Although vilified by extreme left-wing environmentalists, Sodium fluoride is the #1 important ingredient of toothpaste. It remineralizes teeth and prevents demineralization (essentially makes your teeth hard and keeps them from being softened by bacterial acids). It also inhibits bacterial growth. Too much fluoride, like virtually any other substance (including water!) is toxic to humans. Fluoride overdose is the reason for the warning label on the back of toothpaste. Sodium hydroxide: This neutralizes the pH of other ingredients. Sodium Laurel Sulfate: SLS is a detergent that makes toothpaste lather. You’ll find it in lots of other products, such as shampoos, for the same purpose. It can irritate skin and mucous membranes. Some people are very sensitive to it and get canker sores when exposed to SLS. Sodium saccharin: All this stuff I’ve listed tastes bitter. Since sugar is off the table for obvious reasons, artificial sweeteners like saccharin are used to sweeten toothpaste. Sorbitol: This is also used as a sweetener, but it also works as a humectant and texturizing agent in toothpaste. 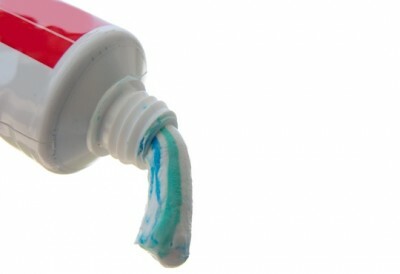 Titanium dioxide: a coloring agent to give toothpaste its bright white color. Triclosan: An antimicrobial agent found in lots of products like soaps and body washes. This ingredient is fairly controversial, probably with good reason. It has been listed by the EPA as a pesticide. The FDA has been investigating this one for a long time, but hasn’t found reason to discourage consumer use of triclosan-containing ingredients yet. Xanthan gum: viscosity agent found in foods and lots of personal care products. If you’re like me, you’re impressed by how many ingredients go into that little tube of paste we all take for granted. You might be a little worried as well because of how industrial some of those ingredients sound. Toothpaste is certainly not fit for consumption. The moral of the story is that you should be spitting and rinsing thoroughly. Now that you’ve seen what is inside your toothpaste, let’s say your 3 year-old son gets into the bathroom cabinet and eats a half tube of it. What should you be thinking and what should you do? First of all, don’t overreact. Yes, I know the warning label sounds scary, but you need to realize how much fluoride it takes to cause toxicity or death from overdose. The average pea-sized amount of toothpaste (both normal and kid varieties) has about .24 mg* of fluoride, nearly the equivalent of a glass of tap water in fluoridated communities. For a 22-pound child (average two year-old) the lethal dose of fluoride is 320 mg, which is more fluoride than what is contained in two full-sized tubes of toothpaste. For a 45-pound child (8 year-old), the lethal dose is 655 mg. To get that much fluoride your child would have to consume over four tubes of paste. In other words, you shouldn’t be concerned about your child dying from toothpaste, even if they eat a ridiculously large quantity. Poison control reported data on fluoride overdose calls from 1989 to 1994. Of the 10,000 calls they received for fluoride overdose, only two were life-threatening cases and neither resulted in death. Toxicity is a much bigger concern. Toxicity can happen with much smaller amounts of fluoride. The 22-pound child mentioned above might get slight toxicity at 1 mg of fluoride (the equivalent of ingesting a really huge glob of paste, much more than is used for brushing) and the 45-pound child might get slight toxicity at 2 mg of fluoride. The most common symptoms of fluoride toxicity are nausea, vomiting, and headache. If you suspect your child has ingested too much toothpaste, it never hurts to call poison control (see number below), but generally you shouldn’t need an emergency room visit unless your child has consumed a tube of toothpaste or more. So in summary, with fluoride overdose, you don’t need to lose any sleep over this, but caution is definitely warranted. Supervise the brushing that your young children do (you should be doing this anyway), keep the toothpaste cap tightly secured, keep toddlers out of the bathroom altogether when you’re not around, and keep any high concentration fluoride products where your kids won’t find them. If you do need poison control, call the number below. It probably wouldn’t hurt to save it in your phone as well, just in case. *Please note that this math does not apply to prescription toothpastes, which have a much higher fluoride concentration and would obviously be more dangerous to kids.